[News] Coming Soon in Crossout — NVIDIA HBAO+! 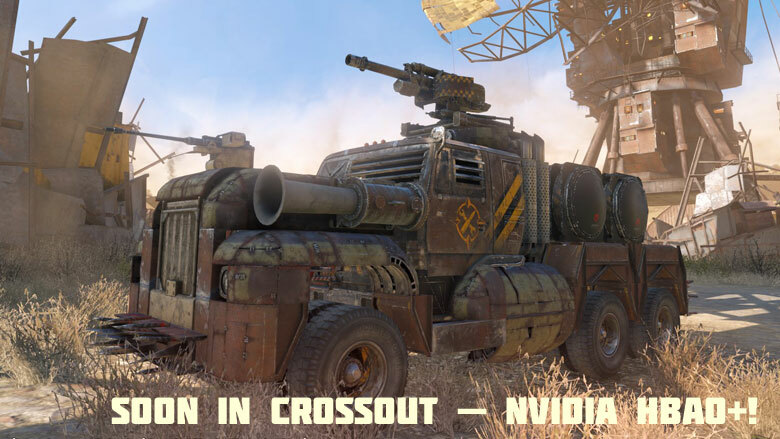 [news] [News] Coming Soon in Crossout — NVIDIA HBAO+! We are confidently moving forward, constantly working on improving technology in the game and we are always happy to share new graphical options.The game world is getting better right before our eyes, which only makes us happier. Today we would like to share news about a new feature from the upcoming patch 0.7.20 — Screen Space Ambient Occlusion (SSAO). In our case, NVIDIA HBAO+ technology is used. This technology is designed for fairly efficient graphics cards and will be available if your computer meets the recommended system requirements. Despite its name, NVIDIA HBAO+ is available not only on GPUs from NVIDIA. You can enable it on all video cards with DirectX 11 support. 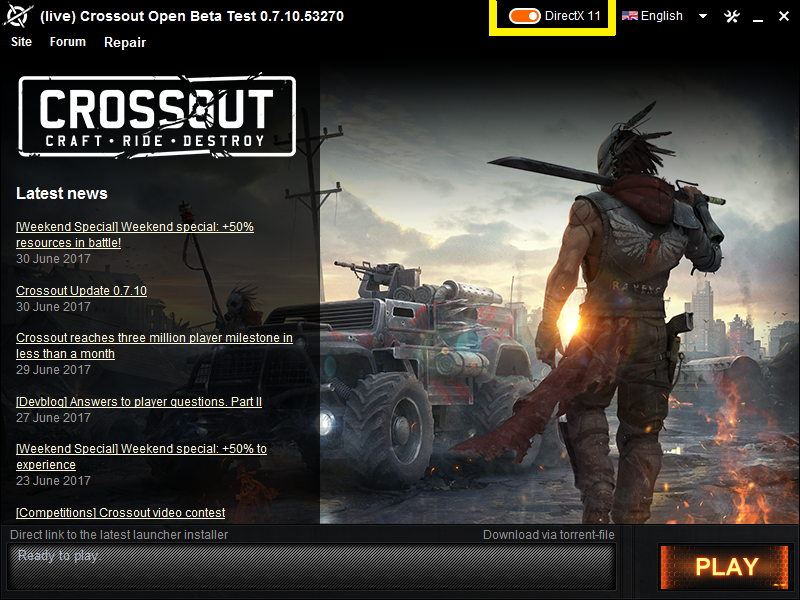 In addition, you will need to switch to the client with DirectX 11 support through the game's launcher. It's very simple! In the Launcher window, click on the DirectX version switch so that it matches the one shown below. We strongly recommend that you switch to the DirectX 11 version, even if your system does not support it. In this case, the DirectX 9 version of the client will start automatically. Interests:A sense of pride and accomplishment. Getting a phone. Fallout 63 FPS lock. Looks great! Any news when the textures and paint jobs will get a higher quality? That's nice. I love lightning effects, it's the kind of small detail that make something so much more realistic without people being able to identify what actually changed. To be honest tho, what the game really need right now is a balance pass & game-play improvements - not better special effects. Looks great! Ambient occlusion always adds some real nice contrast with it's subtle shadows. Just noticed the foliage has shadows now too, nice! I always thought the visuals in this game were a little bland (no offence, just a lack of color and contrast) but it looks like this is what the game was missing for nice clear visuals. It's possible to add AO via Nvidia Inspector currently (DX11 and DX9 - though with quite limited draw distance for the latter), but the official implementation will likely look and perform better. Both of the high-resolution picture links in the post open to the same image (larger version of the first picture). well finally, as of now lighting and shadows look rather flat, this will certainly help a bit. I would love if foliage would cast shadows, but I guess that might be too much hw intensive. Sure looks like quite the improvement, looking forward to see what other graphical improvements and optimization you will do. What we need is weapon balance and improvements. Always nice to see little tweaks for graphics but please fix the weapons in 0.7.2. That should be a priority number one vs other patches delivering us skins etc we don't need. Both links are the same address. I want to figure out what is on the back of the truck as what ever those are, they are not in game as of this post. Also old large fenders, can the community have them too? The ones in the game right now could be steffenwolf and the old ones scavengers. Gas cans will not stack and a these are purple gas tanks. Great! Waited so long for that! Being a Nvidia pathed setting it will likely cripple every AMD card (on purpose, cause Nvidia is dirty like that). Also in most other games that setting does destroy performance for such a minor increase in visuals. What about SSBC, HDAO, SSAO non Nvidia versions. Oh I do like you adding new things though, but currently performance is great even on my old 7950 3GB, I play in 4k ( 3840 × 2160 ), medium I think and its mostly 60 fps (capped), 55 fps when some smoke right in the screen, or 45 fps in extreme battles on raid maps. 7950 is from 2012?!?!! Free Beer for your graphics guy !!! Yeah looks very pretty if i driving with my blue weapons and the yellow/gold wepon's killed me!!! xxxx$§ the balance ! ! !